Daimler chief Dieter Zetsche is sweeping away layers of bureaucracy and encouraging a more experimental approach to new products. FRANKFURT -- Daimler is embracing Silicon Valley management techniques in a drive to speed up decision making, empower staff and fend off new rivals such as electric-vehicle maker Tesla Motors. 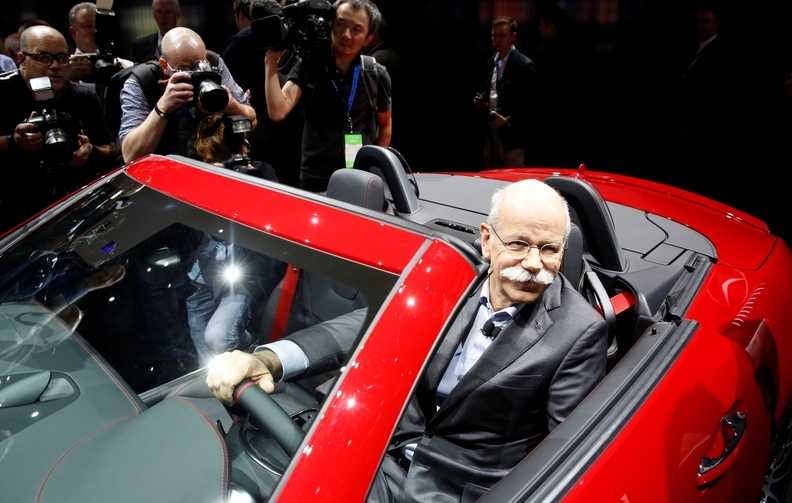 CEO Dieter Zetsche is sweeping away layers of bureaucracy and encouraging a more experimental approach to new products. He has also asked 144 employees -- many of them from the rank and file -- to generate new leadership ideas, according to sources at the automaker. The changes will be closely watched by rivals such as BMW Group and Audi as traditional carmakers weigh how to respond to new technologies including autonomous driving and electric vehicles that have turned companies such as Google and Tesla into rivals. Alexander Hilliger von Thile, a senior graphics and rendering manager at Mercedes-Benz research and development in North America, said Daimler was now encouraging ideas from all team members and not just the bereichsleiter or department chiefs, as well as greater collaboration. Daimler, which owns the Mercedes brand, was like many traditional carmakers initially skeptical about prospects for electric vehicles. According to a senior executive, Zetsche used to joke that Daimler, which owned a stake in Tesla from 2009 to 2014, was the only automaker to make money from electric cars when it sold out of that investment. But advances in battery technology and the success of the Tesla Model S, which last year outsold Mercedes's flagship S class in the United States, have changed that. The risks associated with releasing new technologies, however, were laid bare earlier this year when Tesla shares tumbled after news that a driver of one of its cars had been killed while using Autopilot mode, an advanced cruise control tool that other automakers have taken a more cautious approach to introducing. So far, Daimler staff have generated around 150 ideas, of which 80 percent have been implemented. The results are confidential, although it is clear that in future, decisions should be reviewed by only two management levels instead of up to six, the source added. Daimler calls this "corporate crowdfunding" -- a technique learned during last year's Silicon Valley trip, when managers also met start-ups such as San Francisco-based La Cocina, a nonprofit organization helping low-income food entrepreneurs. Tesla's success has given rise to a raft of rival electric-vehicle makers, including Faraday Future, Borgward and Future Mobility Corporation, and traditional carmakers have seen several high-profile defections. Carsten Breitfeld, CEO of China-based Future Mobility Corp., switched in July from BMW, where he was head of the i8 electric vehicle program but grew tired of the cumbersome approval processes at large corporations. Mercedes engineers have spread the knowledge for how to build its electric cars across a broad team which keeps some of its key know-how in books that are available in print only -- to prevent anybody emailing them.